For other people with the same name, see William Parr (disambiguation). William Parr, 1st Marquess of Northampton, 1st Earl of Essex and 1st Baron Parr, KG (14 August 1513 – 28 October 1571) was the son of Sir Thomas Parr and his wife, Maud Green, daughter of Sir Thomas Green, of Broughton and Greens Norton. William Parr was brother of the Queen consort, Catherine Parr, the sixth and final wife of Henry VIII, and of Anne Parr. Parr took part in suppressing the rising in the north of England in 1537, and after serving as Member of Parliament for Northamptonshire was made Baron Parr in 1539. In December 1543, just after his sister had married the king, he was created Earl of Essex, a title formerly held by his father-in-law, Henry Bourchier, who had died in March 1540. He was Edward VI's "beloved uncle" and one of the most important men at Edward's court, especially during the time of John Dudley, 1st Duke of Northumberland's time as leader of the government. Parr was lord-lieutenant of five of the eastern counties, and Lord Great Chamberlain from 1550 to 1553. Parr, and especially his wife, were leaders in the attempt to put Lady Jane Grey on the throne after Edward's death. He was convicted of high treason, attainted, and sentenced to death on 18 August 1553 after the accession of Mary I. He was, however, released in the autumn. His titles were restored to him by Elizabeth I in 1559. On 9 February 1527, Parr married Anne Bourchier, 7th Baroness Bourchier, daughter of Henry Bourchier, 2nd Earl of Essex. On 17 April 1543, their marriage was annulled by an Act of Parliament and her children (by her lover) were declared bastards. 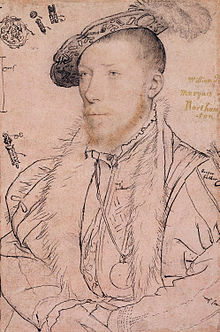 Parr also obtained his ex-wife's lands and titles, being created Earl of Essex on 23 December 1543. He later married Elisabeth Brooke, daughter of George Brooke, 9th Baron Cobham. Their marriage was declared valid in 1548, invalid in 1553, and valid again in 1558. Elisabeth died in 1565; five months before he died, he married Helena Snakenborg, a lady in waiting from Sweden. On his death, at Warwick Priory, as he had no children, his titles became extinct. His body was laid to rest in St. Mary's Church in Warwick, buried in the chancel of the church. Queen Elizabeth paid for his funeral and burial. His tomb is inscribed: William Parr, Marquis of Northampton; Died in Warwick 28 October 1571. [Buried] with the ceremonial due [of a] Knight of the Garter to the Order of Queen Elizabeth who bore the expense of the funeral, 2 December 1571. Chisholm, Hugh, ed. (1911). "Northampton, Earls and Marquesses of" . Encyclopædia Britannica. 19 (11th ed.). Cambridge University Press. p. 766. ^ 'Warter – Warwick-Bridge', A Topographical Dictionary of England (1848), pp. 475–482. URL: http://www.british-history.ac.uk/report.aspx?compid=51379&strquery=william+parr Date. Retrieved 28 May 2011. ^ a b c d e f g h i j k l Douglas Richardson, Plantagenet Ancestry: A Study In Colonial And Medieval Families, 2nd Edition, 2011. pg 661/63. ^ a b c d e f g Douglas Richardson, Plantagenet Ancestry: A Study In Colonial And Medieval Families, 2nd Edition, 2011. pg 657/58. ^ Douglas Richardson, Plantagenet Ancestry: A Study In Colonial And Medieval Families (Royal Ancestry). Genealogical Publishing Company (30 June 2004). ^ a b Burke's Peerage, 1938, p. 2416. ^ The Family Chronicle of Richard Fogge, Archaeologia Cantiana, Vol 5, 1863. Wikimedia Commons has media related to William Parr, 1st Marquess of Northampton.